As game makers, watching millions of passionate players get their hands on our game has been incredibly exciting and – in many ways – inspiring. Believe us when we say that your participation is making the game better, and we’re humbled that so many of you took time to not only try the Star Wars Battlefront II Beta, but to share your thoughts with us too. The Beta was just a small piece of what we're making. Yes, there’s more content (new locations, heroes, modes, and the all-new single-player campaign), but we heard your feedback loud and clear after the first game. 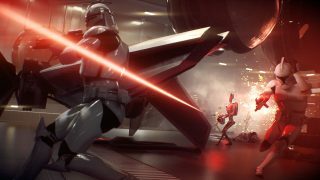 There is more player choice in multiplayer through a deeper progression system and an evolving, event-driven live service that keeps the community together by moving away from Season Pass and having all new gameplay content free for all Star Wars Battlefront II players. Rest assured, we’re continuing to listen to you coming out of Beta. We’re taking a look at some of the most discussed topics, from Crates and progression to Strike mode (which we're considering changing to a best of three), the Specialist’s Infiltration ability (which might be a little too overpowered) and more. Oh, and the First Order Flametrooper needs some work – we agree he could use a little more... firepower. We are also looking into more ways to allow players to stay and play together as a team – for launch, we’ll have a new feature for you that rewards all players in a spawn wave. These are just a few examples of how your feedback is helping to shape the game. Players earn crates by completing challenges and other gameplay milestones. We also have heard some players are looking for a way to play where all players will have the same set of Star Cards with flattened values. Like everything else, we will be continually making necessary changes to ensure the game is fun for everyone. We will work to make sure the system is balanced both for players who want to earn everything, as well as for players who are short on time and would like to move faster in their progress towards various rewards. And you, our community, will play a big role in the evolution of the game. Whether it’s comments on our forums or posts over social media, we’re listening. Your feedback makes a difference, and your passion is what keeps us creating. Again, we want to thank you for taking part in the Beta and helping us make sure that the launch will be, to quote a certain masked Sith Lord, a day long remembered. We’ll have much more to share with you before we see you on the battlefront in November.